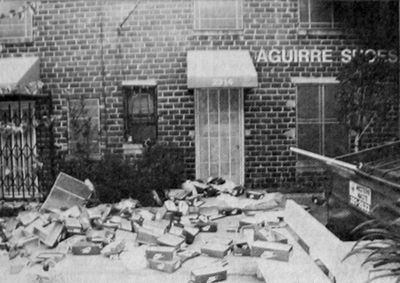 “…After the not guilty verdicts of four L.A. Police Department (LAPD) officers who were charged with excessive force and other charges in the Rodney King beating were announced on April 29, violence erupted around the city,” wrote EGP reporter Jaime Rovero in “Operation Barrio Storm,” published May 7, 1992 in the Eastside Sun. “The areas of Boyle Heights and East Los Angeles received less damage, but was heavily patrolled by local law enforcement and the National Guard,” Rovero wrote in the article focused on the impact of the riots on the mostly Mexican/Latino Eastside. This Sunday marks the 20 year anniversary of six days of rioting that rocked the city of Los Angeles following a jury’s finding that police were not guilty of beating Rodney King, despite a video that showed white police officers beating King, an African American, repeatedly. But it wasn’t just Blacks who were outraged by what could be seen on the videotape. Calls for the arrest of the police officers involved in the beating and loud criticism of the LAPD as a whole came from every corner of the city, including whites and Latinos. So when the decision came down to acquit, it erupted a firestorm of anger that spread across the city, and beyond the largely African American communities of South Los Angeles. “These riots encompassed a huge area that stretched over 32 miles from the Hollywood Hills to Long Beach,” according to Major General (Ret.) James D. Delk, in an article for the California State Military Department/The California Military Museum. More than 2,000 National Guardsman with tanks and heavy artillery were deployed to the city to keep the peace. Six days of rioting, looting, shootings and arson would ultimately end in 55 deaths, thousands of injuries, and more than 3,000 structures destroyed or damaged. Media attention on the 1992 riots at first focused in on the burning of Korean owned businesses by African American rioters. It was reported as a Black/White, Black/Korean conflict, with little attention on the impact of the riots on Latinos, ether as participants or as victims. Latinos were the initial victims of the crowd violence, one third of those killed, one third of those arrested. One third to one half of the businesses looted were Latino owned, according to a 1993 report prepared by the Latinos Futures Research Group for the Latino Coalition for a New Los Angeles. In “Latinos and the Future of Los Angeles,” the authors note that “curiously, many largely Latinos areas were untouched by the violence, even though those areas were inhabited by poorly educated Latinos living and working in poverty,” the same reasoning used by many other researchers to explain the violence that erupted in the Black community. “The vast majority of Latinos were not involved in the looting or arson,” according to David Hayes-Bautista, Ph.D., one of the reports lead authors. Dr. Hayes-Bautista is currently Professor of Medicine and Director of the Center for the Study of Latino Health and Culture at the School of Medicine, UCLA. EGP spoke to Dr. Hayes-Bautista and asked him about the Latino involvement in the riots, and whether he thought the same conditions that sparked the unrest are still present today. “The 1992 riots were essentially two different riots,” he told EGP. From a sociological perspective, there were two disturbances, in one Latinos were participants and in the other, they were the victims, he said. Dr. Hayes-Bautista said while Latinos did participate in the rioting and looting, it’s important to note that they were not a part of the initial outbreak of violence. “It wasn’t until the third or fourth day, when the social network had collapsed and people could not get food or other things they needed, that you really saw Latinos involved in the looting,” he said. Many of the Latinos who were taking things from local businesses did not even know about the Rodney King case or the acquittal of the police officers, their participation was more about opportunity than a demonstration of outrage, he said. Doris Castaneda worked in Lincoln Heights when the rioting broke out. She recalled that her son David, 14 at the time, begged her to let him steal a microwave from a store that was being looted by some of their neighbors. An immigrant from Guatemala, Castaneda had paid a coyote, (smuggler) to bring her five children to the U.S., just two years earlier. “David was shaking, begging me, telling me ‘come on mama,’ you know you have always dreamed of owning a microwave, but we’re never going to have enough money to buy one,” he said, tears rolling down his face. “But I told him we work for what he have, we didn’t come here to be thieves,” she told EGP. “But part of me really wanted him to just go and grab it,” she said, speaking in Spanish. Castaneda said she sent for her children because she thought the U.S. had more to offer them, even though she was able to send home enough money every month to pay for private school, food and clothing, and to help her in-laws whom her children lived with make ends meet. Dr. Hayes-Bautista said part of the collective behavior that happens when social norms breakdown is you do things you might not do otherwise: “We saw it during Hurricane Katrina,” he said. In areas like East Los Angeles, where there is a strong sense of community, where people feel connected, where there were very active parishes and churches, there was no where the same level of violence or looting, or the burning of businesses that occurred in some other areas, Dr. Hayes-Bautista said. In those areas it was not as easy for your actions to be anonymous, because the people you are attacking, or the people who own the businesses you are looting, are probably your neighbors. “After the riots were over, we saw many instances of Latinos returning the items they had stolen,” he noted. They went back to the business and apologized, he said, but again, that was in the areas where the sense of community was the strongest. The riots were the worst in areas where there were large numbers of unaccompanied men, where there were already problems, isolation, he said. Latinos, like African Americans, had many complaints about how they were treated by the LAPD and the Sheriffs; it’s something they had in common. 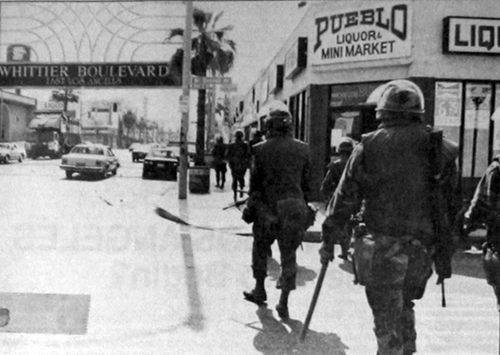 Yet, during the riots, many of the residents of East Los Angeles came to the aid of the LAPD and the National Guard, according to a story in EGP newspapers. “LAPD Thanks E.L.A. Residents,” May 7, 1992: Although there were a few minor incidents of looting, the majority of citizens continued to show restraint and respect the law,” said Capt. Bob Medina. “They were quick to come to the aid of police and the National Guard, and, in many cases, provide food, drink and lodging at no cost for the officers who were protecting their homes and businesses,” Medina said. “I don’t know if those same conditions exist at the same level today,” Dr. Hayes-Bautista said, referring to the lack of a sense of connection in some Latino communities where rioting occurred. Could it happen again today? “In 2006, half a million people marched in the immigration marches in downtown,” there wasn’t really any violence, he said. They were there in a common purpose, he noted. While, as Dr. Hayes-Bautista alludes, there is a greater sense of community and purpose among undocumented immigrants and their supporters, it doesn’t seem unreasonable that they would still feel marginalized by the failure to bring about comprehensive immigration reform, or discriminated against by laws enacted to criminalize their presence in the US, or that Latinos who are US citizens would also fear those same laws as another excuse for racial profiling. When you factor in that there are still a lot of Latinos, living in poverty and struggling just to get by, isn’t a riot like the one in 1992 still a possibility? EGP asked Dr. Hayes-Bautista. Latino communities are densely networked today, he responded. There is an even greater sense of community, and responsibility to community, so violence, to the level of the 1992 riots, seems less likely he said, still noting, however, that it could happen. And while the reasons for rioting might have been different for African Americans and Latinos in 1992, today there is a greater sense of understanding between the two groups, Dr. Hayes-Bautista said. He said the demographics of many of the once mostly African American communities have changed over the years. Latinos, once in the minority in those areas are now the majority in some of the neighborhoods. The African Americans kids are learning about Latinos, and what Cinco de Mayo is really about, Dr. Hayes-Bautista said. They are beginning to learn that Latinos were on their side during the Civil War, for example. Latinos still represent the majority of the participants in the May Day protest marches and rallies, like the one coming up next Tuesday, African Americans, Asians and other ethnic groups also turn out in noticeable numbers. These new connections will transform how those growing up see themselves and others. The 1992 Los Angeles Riots was the result of many issues coming to a head at the same time. For many the Rodney King beating was the end of the line, but it was also the start of a new coming together in community. A shorter version of this story was published in all 11 Eastern Group Publication newspapers on April 26, 2012. For the record: Archive photos used in this report are by Jose Marin. IM ashamed of my people for participating in such a horrible event. In the end my Raza victimized our own people all for what? For Rodney king? We didn’t care about him or any African American before this yet we participated in rioting and looting for selfish gain! Shame on those corrupt cops that beat king….shame on THE system…..shame on my Raza who participated! I remember buying a textbook in college wherein the authors claimed that while South Central L.A. burned, East L.A. was as quiet as could be with no incidents at all to speak of. This couldn’t be further from the truth. On the evening of April 29, 1992, I rode my bike to Whittier Blvd. and arrived at a scene that was about to spark into a riot/uprising. Literally thousands of people lined both sides of the Boulevard with crowbars, chains, two by fours, and other assorted weapons, just waiting for someone to light a fire to the fuse. Some in the crowd clamored “start it up!” yet no one took their dare, except for someone throwing an object at a business. Within minutes, Sheriffs in riot gear dispersed the crowds, but not before some businesses under the Whittier arch had already boarded up their store windows with plywood. The next few days were really tense–National Guardsmen marched down residential streets and even stood guard on my corner. You had to be home before the sun went down and you couldn’t leave your house until the sun rose the next morning. It was reminiscent of the sun down laws of old, except that this time, martial law had taken the place of the laws in the books. The media warned that we could be shot if found on the streets during the dark hours. We also heard that Garfield H.S. had been temporarily converted into a National Guard station and that the guardsmen slept in the school’s cafeteria. East L.A. wasn’t as quiet as many had believed after all; but the community did remain relatively peaceful when compared to other parts of the county and, specifically, to some parts of the City of L.A. When I was 18, me and Jaime Rovero (writer) covered the L.A Riots in East Los Angeles, and Boyle Heights. The looting was not so much about the verdict, but it was sad to say .. it was about opportunity. I tried South Central on my own, but it was just too dangerous. I also have pics of Ground Zero, but I have moved several times since then, and are packed in boxes somewhere. My memory is fuzzy now, but when I see these pictures, it takes me right back.. I got an opportunity to shadow the Hollenbeck Police Dept. during the actual riots, and gave me access, and handled me as a total professional. I will find the originals soon, to post some photos. The photos on this article are mine, by the way. I also remember covering the L.A Riots in East Los Angeles, and Boyle Heights with Jose Marin. I also agree with Jose, it was not about the riots but more of opportunity. They said screw lets jump on the band wagon and loot like everyone else in South Central LA. I still remember fresh in my mind about the riots and protecting my father’s business at the El Norteno de Savy Store on Cesar E Chavez Ave. in Boyle Heights. This piece provides anecdotal evidence. How can one say that it wasn’t about outrage, but provide an example from East LA, where very little rioting occurred. I am watching a documentary on the LA riots as I type this. In much of the looting footage that happened after the initial riot night there are a majority of Hispanic/Latinos actually doing the looting. I admit that there wasn’t even remotely the level of violence as some of the initial riot’s footage of mainly black rioters. However much of the looting I saw on subsequent days was done by the Latino/Hispanic community.